Clear Labels; Custom Printed on Rolls | Pro Transparent Label Printing! 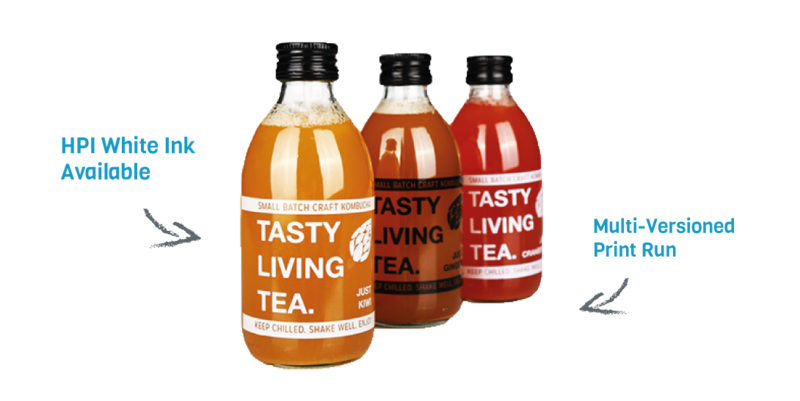 When skilfully positioned, clear labels are an ideal solution for creating striking product packaging; transparent labels also offer greater flexibility, as well as lower entry level costs than traditional screen printing (printing directly onto a bottle or jar); particularly where short to medium print production runs are concerned. The concept of digital label printing and multi-versioned print runs is also available to transparent materials; where all labels remain the same shape and size, different SKUs can all be printed in the same print-run. As a result, digitally printed clear labels are employed by brands and businesses of all shapes and sizes across many industries. Printing white ink onto transparent labels is a very popular request. To ensure quality, we use a “double-hit” of white ink as standard; white ink printed on top of white ink. Increasing to three and four “hits” can lead to the ink being able to be scratched away from the design/label. White ink can also be utilised, for technical reasons, as a form of “undercoat” on a clear, transparent labels. The white ink undercoat is not seen on the finished, printed labels as it is used behind other colours within the design. Printing a white ink behind other colours avoids them looking translucent; it essentially keeps the printed colours looking as they should, the white ink simulates the effect printing colours onto a white paper material. Clear labels can only be produced on a select range of materials; we produce clear labels exclusively on transparent polypropylene film. The additional benefits of producing custom printed labels on transparent PP film (sometimes referred to as “vinyl“) is that the material is completely waterproof as well as oil and chemical resistant. Where transparent labels are concerned, it’s also important to consider the effect of the adhesive element; our adhesive is a permanent, industry-ready clear adhesive. The adhesive will not be seen once the label has been applied. Why is a PET Carrying Material required for creating a “No-Label” Look? Although not necessarily apparent to the naked eye, “PET carrying materials” is much “smoother” than a “glassine paper carrying materials.” As a result, when removing labels from their roll, whether by machine or manually, the adhesive is far less “disturbed/ruptured.” Where glassine paper carrying materials are used, ruptured adhesive will create a slightly visible “milky” layer when the label is applied to a container; the last thing you want to see when a “no-label” look is required. The best way of applying roll labels for the no-label look is mechanically, in order to avoid air bubbles and structural formations in the adhesive label. Applying clear labels mechanically allows the user to keep “tension” in the label reasonably high; this cuts the risk of air bubbles dramatically. We recommend using a UV protective varnish in order to prevent inks being easily scratched away from your finished labels. Generally speaking, where clear labels are concerned, we recommend using a UV protective varnish gloss as this keeps the label looking crystal clear. A UV protective varnish matt can lead to the label looking slightly cloudy in comparison. We are able to print white ink onto transparent films, however, there are a few small artwork considerations that must be considered. White ink is known as a “spot colour” and should be set up in a different manner to all other colours. Either see our artwork delivery guidelines for more information or review our professional artwork services. Label artwork always has been and always will be a key part of the label printing process. For business who do not have resources to ensure their artwork is print-ready, we have a range of Artwork Services available. There are many reasons as to why your business may need to see a press-proof before placing a full custom label order. We’ve developed a range of cost-effective proofing services. Slightly “Milky” Layer once Applied.